It is perfectly human that when someone important dies we start thinking about it. And sooner or later all kinds of theories come out about what happened especially if they are supported by ”proofs” that came from different sources than the ones officially recognised. It is perfectly normal that we want our heroes to be a little superhuman and unmistakable so usually the simplest and easiest explanation is simply not enough. We start searching for the ”truth” or ”our truth” that mostly has no connection with reality. One of that moments happened on May 1st 1994. 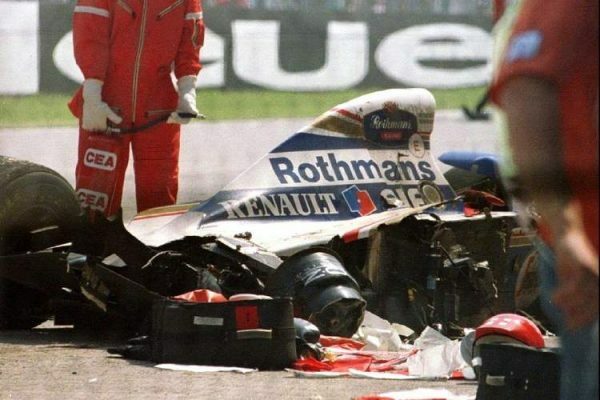 Result of unpredictable circumstances and unlucky actions caused the death of one of the greatest drivers of that era Ayrton Senna. Moments after the tragic impact lots of people started talking about more or less confirmed sources about what ”really” happened and what was the ”real” cause of the accident. There were theories that are still alive today that Ayrton was under heavy psychologial stress after the death of Ronald Ratzenberger and personal love issues. But let’s be serious for a moment. Do we really believe that such a great racing driver, a three time Formula one world champion wasn’t mentally strong enough to overcome that? I am sure that when he put his racing helmet on he left his problems behind. Even if they didn’t share much time together, the death of a fellow colleague driver was more of a motivation for winning than a death premonition. A second, more plausible theory talks about his Williams driving over debris from a previous accident and got a tyre puncture. That is possible however do we really believe that such an experienced driver as Ayrton Senna did not notice that? I think it’s almost impossible. More so we were in the era right after the ban of active suspension with all the information about the ride height of a car immediately available in the pits. There however was no sign of any puncture. Some might argue that the team covered something but all that information only confirmed that was a fatality and not a conspiracy. And now for the biggest theory of them all, the one about the poorly welded steering column. That column was fixed especially on Ayrton Senna’s request before the race. However it was fixed in a way that anyone who knows a little bit about racing cars would consider it unacceptable if not offensive. Such modifications are not acceptable even in local lawn mower races and here we are talking about Formula 1. The fact is that the steering column was broken yet it remains a mistery if that happened before or after the crash. The footage from the camera is showing what everybody would want to see, however the tape stoped when the crucial moment came. The big process in Italy based on that fact found the team guilty yet nobody was sent to prison. And after years of trials what remains is just theories without any strong proof. After all these theories I dare making my own one. One that is based on simple and possible things that probably happened. I hope that we all agree that Ayrton Senna was a stubborn character, one that drove always on the limit of his car and sometimes even exceeding that limit. His driving style was rather nervous, always searching for the grip of the car. That was a part of him, a part of his greatness. On the other hand the Williams FW16 had a little flaw. It was an evolution of the FW15C but without the active suspension. Patrick Head and Adrian Newey confirmed that that car had a very narrow setting window and was very prone to change from an oversteer tendence to an understeer one. We also have to keep in mind that FW 16 had a servo assisted steering which was a new thing in that era. Only with the revisited WF16B the Williams team partially solved that issues and won the constructor championship at the end of the year. Here I think it is right to mention the words of the closest person to Ayrton in that race and who should know the situation best, his team mate Damon Hill who said that it was a driving mistake and not a strange conspiracy. I hope we all agree about Ayrton Senna being an extraordinary human being and driver however he was not a mythological god. Maybe he really did a mistake and in combination with an unpredictable and nervous racing car, Ayrton Senna found himself in a situation that even he was not able to solve.